This is a set of mid century modern Danish teak nesting tables with tile tops in an abstract design. Dimensions of tables: Large table: 20.5″W x 14″D x 18″H, Medium: 18.5″W x 14″D x 17″H, Small: 16.5″W x 14″D x 16″H. 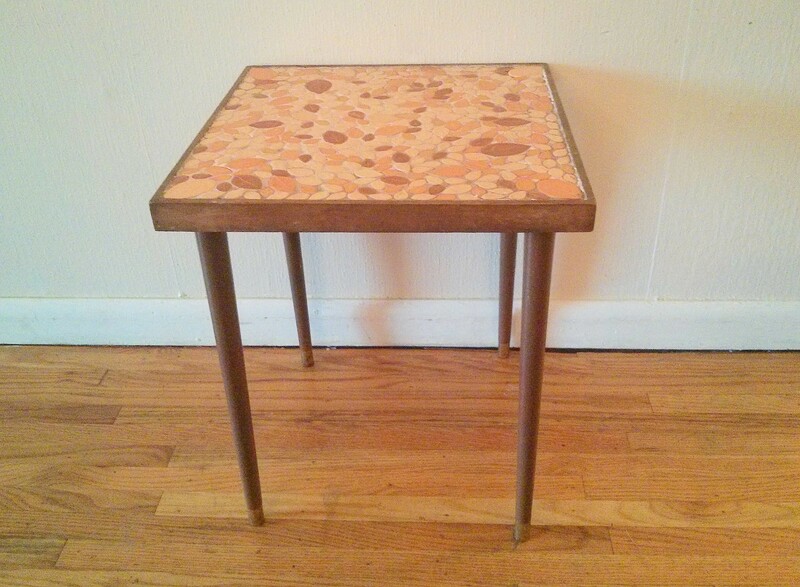 This is a mid century modern Danish teak tile top table with an abstract gold circle design. Dimensions: 20.5″Wx 20.5″D x 20″H. These are 4 sets of mid century modern stacking nesting tables with tapered legs. The first set of tables has a clover tile design: 16″W x 16″D x 15″H. The second set has a bursting floral design: 15″W x 15″D x 16″H. The third set has a round tile design: 15″W x 15″D x 15″H. The fourth set has a fleur de lis design: 15″W x 15″D x 15″H. All dimensions listed is per individual table. All nesting table sets are sold. This is a Danish teak side end table with a sunburst tile top. Dimensions: 25.5″W x 17.5″D x 19.5″H. This is a mid century modern side end table with a tile top and cast iron base. The tile top has a beautiful lovebird design. Dimensions: 14″W x 14″D x 17.5″H. This is a set of mid century modern sets of nesting tile top tables marked made in Denmark. The set has 3 tables that fit within each other in descending size. The tables have teak frames and tile tops with an abstract vibrant fiery design. Dimensions of largest table: 21.5″W x 15.5″D x 18.5″H, medium table: 19″W x 15.5″D x 18″H, smallest table: 16″W x 15.5″D x 17.5″H. These are 2 sets of mid century modern sets of nesting tables. Each set has 3 tables that fit within each other in descending size. The first set has Danish teak frames and tile tops with an abstract graphic design. Dimensions of largest table: 21.5″W x 15.5″D x 18″H, medium table: 18.5″W x 15.5″D x 16.5″H, smallest table: 15.5″W x 15.5″D x 15.5″H. The second set has 3 tile top tables with an atomic design, and teak bases. Dimensions: large: 20.5″W x 14.5″D x 19″H, med: 17.5″W x 14.5″D x 18″H, small: 14.5″W x 14.5″D x 17″H. This is a mid century modern coffee table by Lane. 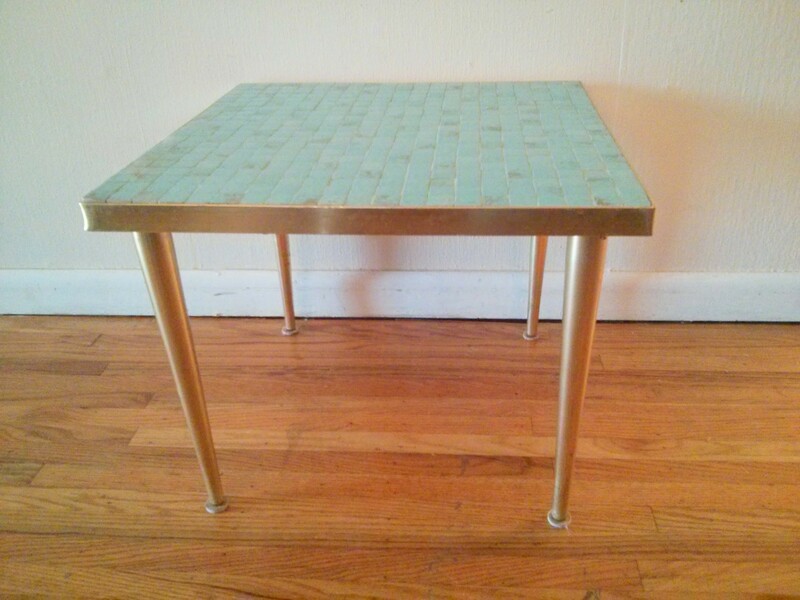 It has a solid wood top, inlaid with a cool gray tile in the middle, and tapered legs: 47.5″ W x 18″ D x 15″ H.
These are 2 mid century modern tile top tables. The first is a square side end table with a solid wood splayed base and a white and caramel tile top: 24.5″W x 24.5″D x 17″H. The second is a round coffee table with black splayed legs and a speckled black and white tile top: 40″diameter x 17″H. 1 mid century modern round tile top table is sold. 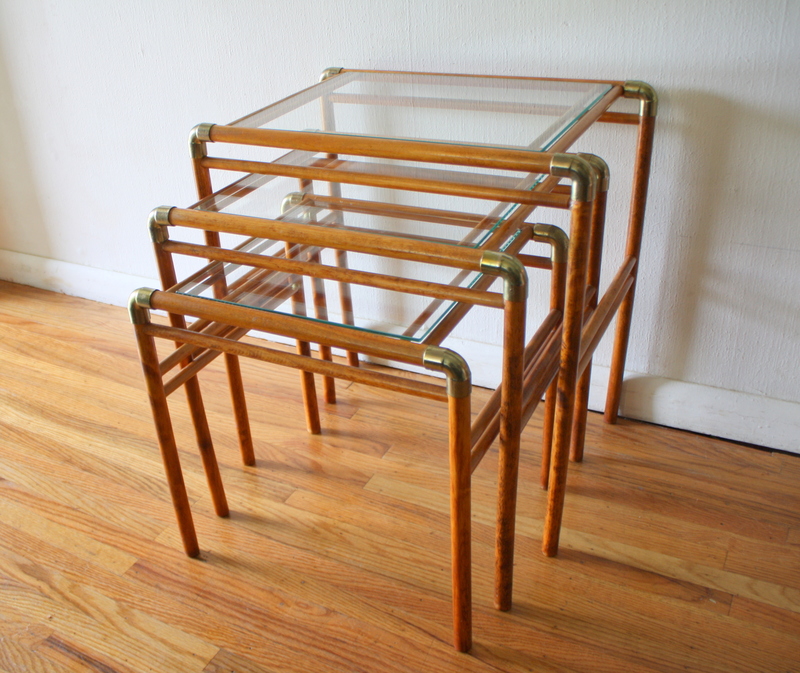 These are 2 sets of mid century modern sets of glass top nesting tables. Each set has 3 tables that fit within each other in descending size. 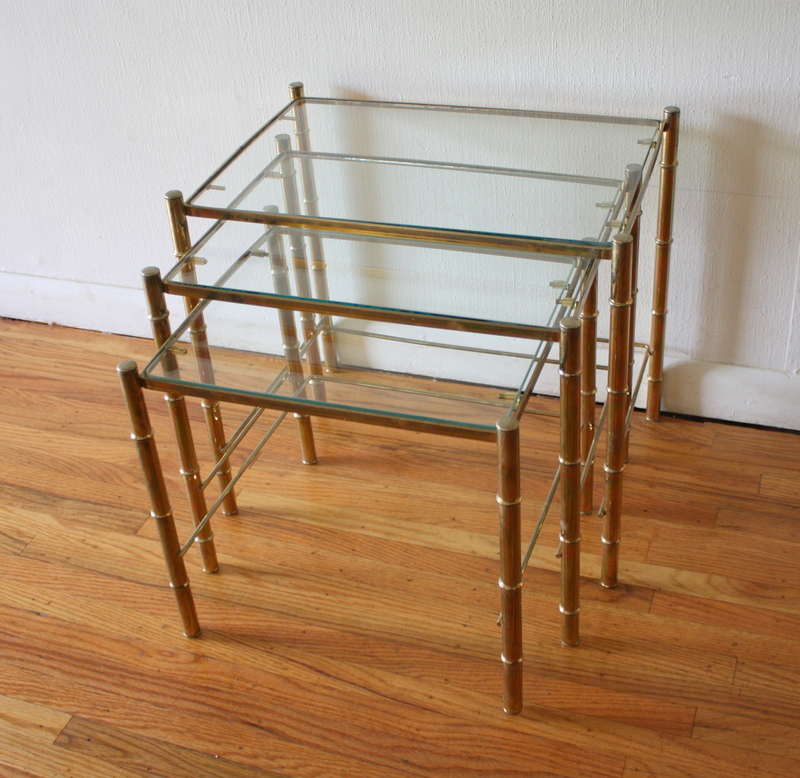 The first set has brass frames in a faux bamboo design, and glass tops. Dimensions of largest table: 19″W x 13″D x 17″H, medium table: 17″W x 13″D x 16″H, smallest table: 15″W x 13″D x 14″H. The second set has solid wood frames with brass accents and glass tops. Dimensions of largest table: 21″W x 14″D x 22″H, medium table: 19″W x 14″D x 19″H, smallest table: 17″W x 14″D x 17″H. These are 2 mid century modern side end tables with vibrant tiles and tapered legs. 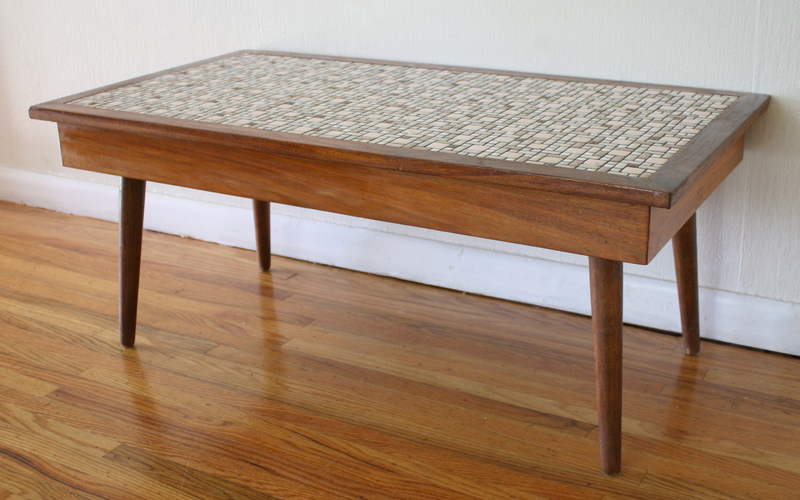 This is a mid century modern coffee table with beautiful retro tile work. It is made out of solid wood and has the signature mcm tapered legs.